2014 WCC Art Faculty Exhibition at Iolani Gallery, Windward Community College. Exhibited 20 ceramic pieces. 2014, CLAY, Iolani Gallery, Windward Community College. Thirteen Ceramic Artists from Hawaii. Three Ceramic Sculptures and Two Wheel Thrown Forms, Stoneware Vase and a Porcelain Cover Jar. My work was featured in the Honolulu Star Advertiser, Sunday Today Section. Cedar Street Galleries, Honolulu, Hawaii. – Matchbox Plus VIII. Invited Artist. One Porcelain Bottle, Chun Glaze. Hawaii Craftsmen 45thAnnual Statewide Juried Exhibition. One Stoneware Landscape Platter with oxides and textured design. Cedar Street Galleries, Honolulu, Hawaii. – Matchbox Plus VII. Invited Artiist. One Porcelain Bottle, Chun Glaze. Koa Art Gallery – Mixed Media Miniature Show. Invited Artist. Kapiolani Community College, University of Hawaii. One Porcelain Bottle, Chun Glaze. Cedar Street Galleries, Honolulu, Hawaii. – Matchbox Plus VII. Invited Artist. One Porcelain Bottle, Chun Glaze. Koa Art Gallery – Mixed Media Miniature Show. Invited Artist. Kapiolani Community College, University of Hawaii, Honolulu, Hawaii. One Porcelain Bottle, Chun Glaze. Hawaii Craftsmen Statewide Juried Annual Exhibition 2010. Honolulu Academy of the Arts, Academy Arts Center, Honolulu, Hawaii. One Stoneware Platter with oxide brush landscape design. Raku Ho’olaule’a 2010 Exhibition. Hawaii Craftsmen Association. Honolulu Academy of the Arts, Academy Art Center, Honolulu, Hawaii. Faculty Exhibition, Windward Community College, University of Hawaii, Iolani Gallery. Exhibited Ten Stoneware Sculptural Forms, Vases, and a Tea Pot. Cedar Street Galleries, Honolulu, Hawaii. – Matchbox Plus VI. Invited Artist. One Stoneware Wood Fired Altered Bowl. One Raku Bottle. Koa Art Gallery – Mixed Media Miniature Show. Invited Artist. Two Stoneware Vases. Kapiolani Community College, University of Hawaii, Honolulu, Hawaii. Cedar Street Galleries, Honolulu, Hawaii. Matchbox Plus V. Invited Artist. 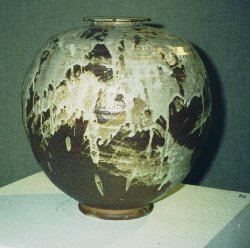 One Stoneware Cover Jar. 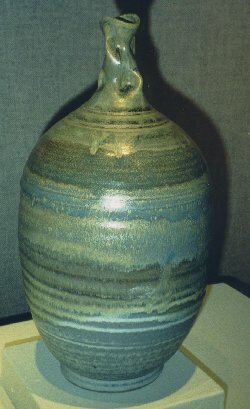 One Raku Bottle. 2007 Hawaii Craftsmen Statewide Juried Annual Exhibition. Honolulu Academy of the Arts, Academy Arts Center, Honolulu, Hawaii. Three Stoneware Bottles, One Stoneware Vase. Showcase 2007. Honolulu Academy of the Arts, Honolulu, Hawaii. Invited artist. Two Stoneware vases, Slat fired with Chun Glazes. 14”x12”. Noreen Naughton / Paul Nash. Iolani Gallery, Windward Community College, University of Hawaii. Title of sculptures in the exhibition: Bones to Earth. 25 stoneware ceramic forms. Sculpture and Pottery Bottles and Bowls. Hawaii Craftsmen 40thAnniversary Annual Statewide Juried Exhibition. Honolulu Academy of the Arts, Academy Art Center, Honolulu, Hawaii. Invited artist. Stoneware bottle, 12”x12”. Showcase 2006. Honolulu Academy of the Arts, Honolulu, Hawaii. Invited artist. Stoneware vase, natural clay color, textured, 12”x12”, and stoneware platter, titled Landscape, high fire glazes and oxides, 14” wide. Couples: Making Art Under One Roof. The Balcony Gallery, Kailua, Hawaii. Three-stoneware vases, salt fired with high fire glazes. Noreen Naughton - Window Series, Paul Nash - Bullet Forms. The Koa Gallery, Kapiolani Community College, University of Hawaii, Honolulu, Hawaii. Two-person Exhibition. 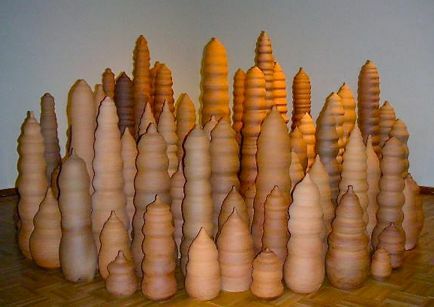 Installation Sculpture consisting of one hundred and six abstract bullet forms, 6” to 50” in height, fired to cone 5, natural stoneware, brown color. Showcase 2005. Honolulu Academy of the Arts, Honolulu, Hawaii. Invited artist. Two-stoneware bottles, red kaki glaze, with rutile wash.
Gallery Iolani, Windward Community College, University of Hawaii, Kaneohe. System wide Art Exhibition. Two wheel thrown altered sculptures, stoneware. 6" wide x 21" in height. Invited artist, Koa Gallery, Kapiolani Community College, University of Hawaii, Honolulu. Mixed Media Miniature Show, Invitational Exhibit. Wheel thrown bottle. Stoneware, Kaki and Chun glazes. 6" in height. Invited artist, Honolulu Academy of the Arts, Honolulu, Hawaii. They Say It's Your Birthday: Happy 75th. Showcase 2002. Wheel thrown bottle, 20" in height, porcelain white slip design, wood fired. Invited artist, East-West Ceramics Collaboration III. University of Hawaii - Manoa. An international exchange in the ceramic arts. Invited professional artists representing the Eastern and Western hemispheres. Tile decorating workshop. I created six stoneware tiles with slip engobes. 12" x 12", working with the other artists. Exhibition, East-West Ceramics III, University of Hawaii Art Gallery. September 1 to September 27th. Selected into Marquis Who's Who in America--West--Ceramic Art Educator. Invited Artist, Koa Gallery, Kapiolani Community College, University of Hawaii, Honolulu, Hawaii. Mixed Media Miniature Show, an invitational exhibit. Stoneware Bottle, Wood Ash Glaze, 8" in height. Hawaii Craftsmen Show, Statewide Juried Exhibition, Honolulu Academy of the Arts, Academy Arts Center, Honolulu, Hawaii. Two Stoneware Bottles, 21" in height, Boron Semi Matt Rutile glaze, 12" in height, Stony Matt Cobalt Blue glaze. Honolulu Japanese Chamber of Commerce 22nd Annual Art Exhibition, Amfac Exhibition Center. Juried exhibition. Two Stoneware Hand build platters, 22" in width, using boron and celadon base glazes. Raku Ho'olaule'a a Juried Exhibition, Amfac Exhibition Center, Honolulu, Hawaii. Raku Bottle, White Porcelain Slip with clear crackle glaze. 13" in height. International Biographical Center (IBC), Cambridge, England. Citation of Meritorious Achievement, 2000, Outstanding Artists and Designers of the 20th Century to Paul Leslie Nash in the Field of Ceramic Art on July 12, 2000. University of Hawaii Board of Regents Award for Excellence in Teaching. Windward Community College. May 18, 1999 Honolulu Japanese Chamber of Commerce 21st Annual Art Exhibition, Amfac Exhibition Center. Juried exhibition. Stoneware Vase, high fired vanadium stony matt glaze. Queen Emma Gallery, Two Person Exhibit. One of a kind wheel thrown bottle forms, high fire reduction and wood fired, using overlapping stony matt glazes with oxides. Invited artist to the U.H. Faculty Art Exhibition, University of Hawaii - Manoa. Two abstract slab construction fertility forms, high fire stoneware with glazes. Art Faculty Exhibit, Windward Community College, Gallery Iolani. Ceramic forms, sculptural fertility shapes, and one of a kind abstract pottery. A Cultural Exchange Joint Faculty Exhibit with Kagawa 1992 Junior College, Shikoku, Japan and Windward Community College. 15 ceramic forms, Porcelain, Stoneware and Raku, Kagawa Junior College Exhibition Room, May 31 - June 15, 1991. RSK Plaza Building, Shikoku, Japan, July 3 - 7, 1991. Ramsey Gallery, Honolulu, Hawaii, September 5 - 27, 1991. Campus Center Gallery, University of Hawaii-Manoa, Honolulu, Hawaii, November 1 - 15, 1991 and the Exhibition Room of the Chancellor for the Community Colleges, Honolulu, Hawaii, January - March, 1992. I use several different themes in my ceramic forms. The forms are either functional - bowls, vases and bottles, or ceramic sculpture - platters, fertility forms and bullet forms. My main interest is the Stoneware High Fire Reduction process. I like the look and feel of the stoneware clay and the glazes that evolved out of China. I enjoy all aspects of ceramics - preparing the clay, making the clay forms, and firing the kilns. I fire my pieces in the Wood Burning Firing, the Soda Firing, or the Reduction Firing kiln. I am trying to achieve a relationship and balance of space and form. There is also the matching of the glazes to the ceramic form. This process actually starts as soon as I make the clay form in the plastic greenware stage. The relationship of all these components needs to come together to create art. As an Art Educator in Ceramics, my main emphasis is to work in clay along with my students. This gives the students a greater awareness of the skills, techniques, and the amount of time needed to create art. Ceramic and Art Professor, Studio Ceramic Artist. Bachelor of Fine Arts, with honors. Major: Ceramics; Minor: Fine Arts; April 1971,Chouinard Art Institute (California Institute of the Arts), Valencia, California. Studied under Ralph Bacerra, Ceramics Department. Master of Arts in Teaching. Major: Art Education; Minor: Ceramics; January 1973, Rhode Island School of Design, Providence, Rhode Island. Studied under Dr. David Manzella, Art Education and Norm Schulman, Ceramics Department. 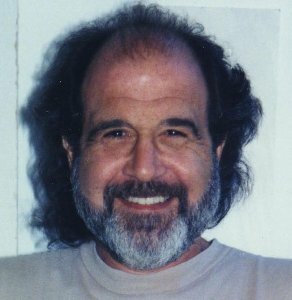 2000 to present - Professor of Art - Ceramics, Windward Community College, University of Hawaii, Kaneohe, Hawaii. 1971 to present - Working as a studio artist in functional and sculptural ceramic forms. 2000 - 2002 President of the Hawaii Craftsmen Association, Honolulu, Hawaii. 1999 Vice President of the Hawaii Craftsmen Association, Honolulu, Hawaii. 1998 Served on the Board of Directors for the Hawaii Craftsmen Association, Honolulu, Hawaii. 1995 - 1999 Associate Professor of Art - Ceramics, Windward Community College, University of Hawaii, Kaneohe, Hawaii. Studio Address: 45-720 Keaahala Rd.